Synopsis : Loss of disability benefit payments (SSD, SSI) due to updates, pictures and videos being used as evidence against you on social media web sites like Twitter, FaceBook and Instagram. 1: You can only control what is on your own profile to a certain extent. 2: Pursuing a disability claim? Refrain from using social media. 3: Our personal lives are ending up splashed all across the Internet. 4: Over 10 Million in U.S. currently receive SSDI benefits. Be careful what you post on Twitter, FaceBook, Instagram and other social media websites - it could cost you your SSD, SSI benefits. The U.S. administration is currently working on a proposal to use social media web sites such as Facebook, Instagram, Twitter and MySpace to help identify people who claim Social Security disability benefits without actually being disabled. For example, if a person claimed benefits because of a back injury but was shown playing sport in a picture on Facebook, this could be construed as evidence the reported injury was not disabling. A recent Instagram post with an old photo, or a Facebook post on a low pain day, could also be used against an applicant for disability benefits. Through social networking websites more and more of our personal lives are ending up flashed across the Internet. While many thoroughly enjoy social networking and its many benefits, being careless with your profile can have grave financial consequences: disability insurers and even the Social Security Administration are increasingly turning to sites like Facebook, Instagram, and Twitter to dig up evidence that can be used to deny a disability claim. Advocates for people with disabilities say the use of social media in this way would be dangerous because photos posted there do not always provide reliable evidence of a person's current condition. 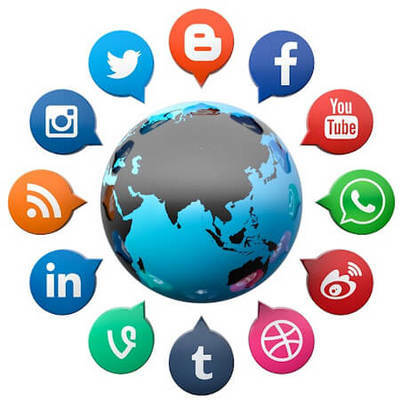 Image of a world globe surrounded by social media icons. The issue at question in most Social Security Disability cases is whether or not you are capable of working. As such, it is easy to see how photos or videos of you dancing, hiking, etc. posted to a Facebook page could be interpreted as harmful to your cause. Even posts and "status" updates that talk about something as innocuous as weekend plans can be taken out of context by a Social Security Judge or reviewer. Sure, you may know you were only joking around about something you wrote on Facebook, but you do not want to have to later explain that to a Judge. Of course, you can control what is on your own profile to an extent. But, your friends may post candid photos of you at events or write online content about you that could cast you in an unfavorable light to someone investigating your Social Security Disability claim. Ask your friends to watch what they post about you, and remove tags of yourself in potentially harmful images. If you are pursuing a disability claim, it may be best to simply refrain from having a social networking page. If you are unwilling to make this sacrifice, you should at least be very careful about what you post and what is posted about you online. The default privacy settings on Facebook allow just about anyone to take a gander at your page, only trusted friends and relatives should have full access. Simply by clicking the account button and scrolling to the privacy settings page, you can restrict who is allowed to view various Facebook content. More than 10 million beneficiaries in the United States currently receive Social Security disability insurance benefits, they have paid into the system through payroll taxes, with a cost of $11 billion per month. Obtaining disability benefits can be a lengthy process so be cautious about your online presence and continue to receive the benefits you deserve. How to Take Control of Your Facebook - Things you have control over that can help make your Facebook experience better for you - Facebook. Reporting Social Security and Disability Benefit Cheats - Information on Social Security Pensions and Disability Insurance benefit cheats including how to report welfare benefit fraud.